Docent at the Instute of Music, Theater and Choreography of Herzen University. 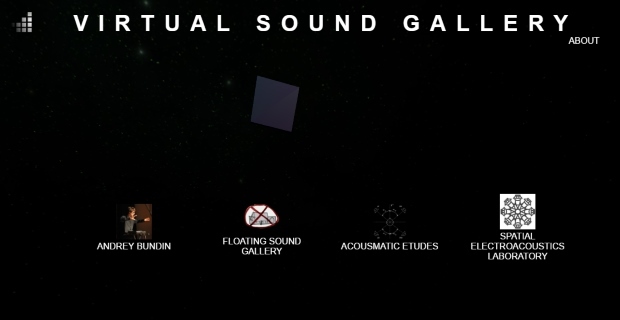 Virtual Sound Gallery is a web stage for modern multichannel music, sound, and audiovisual art. It is an accessible, web-based virtual reality (VR) environment for a visualized binaural simulation of multichannel sound reproduction. The performance involves audience participation with their mobile devices. Connected to a wireless network and organized into one polyphonic multichannel synthesizer, those devices reproduce different noises, samples, and synthesized sounds from random locations in the hall. 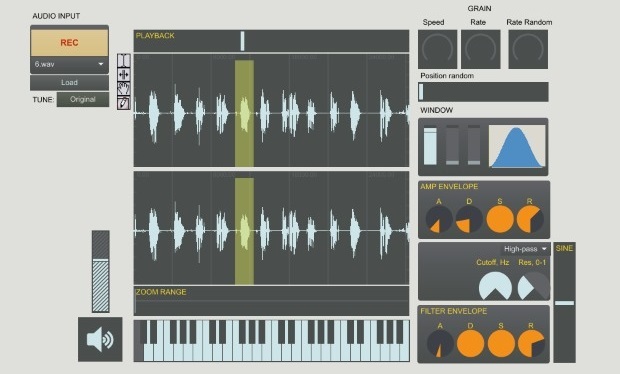 Music for virtual objects, octaphonic sound system, and contactless interface (Leap Motion). There are no samples or live instruments in this work, every sound is generated using physical modelling synthesis. Conundrum for table and electronics, a computer game for one percussionist on stage. This interactive piece is dedicated to Mark Pekarsky, who is the first musician performed it. The premier took place at the Moscow Composer's Union hall during the Moscow Autumn music festival in November 2016. Music of things is a serie of live electronic music works based on a specicific granular synthesizer, which I have developed using Max/Msp. Main feature of this instrument is a capability to freeze any time period of a sample or real-time recording. I can explore and play with timbral and amplitude charecteristics of this freezed sound object. “Aquarius” soundtrack is written specifically for this movie in accordance with the artistic task of the director Timofey Jalnin. Music represents the sensual implication of the story of the man and the woman. Cello is the third actor: it tells what He and She feel but cannot speak about. Deep basses and light harmonic grooves complement the image. Generally, soundtrack reflects the metaphor of the movie: relations between a man and a woman flow like water in the ocean, from silent breeze to dreadful storm. The binaural release of 8.1 acousmatic work. Premier took place during the "Dark Sounds in White Nights" festival of experimental music and sound art at the New Stage of Alexandrinskiy theter, Russia, St. Petersburg, June 24, 2016. In this piece the author follows principles of spectromorphology as a basis for his composition technique. Synthesized and recorded sonic objects and patterns are permuted from noise to recognized sounds and musical tones in a multichannel acoustic environment. Soundtracks of different full-length plays by "PoemaTheatre"
MIDI Room is an online tool for direct real-time MIDI communiction between remote clients. Technically it is a website based on the combination of Web MIDI API and Web RTC. 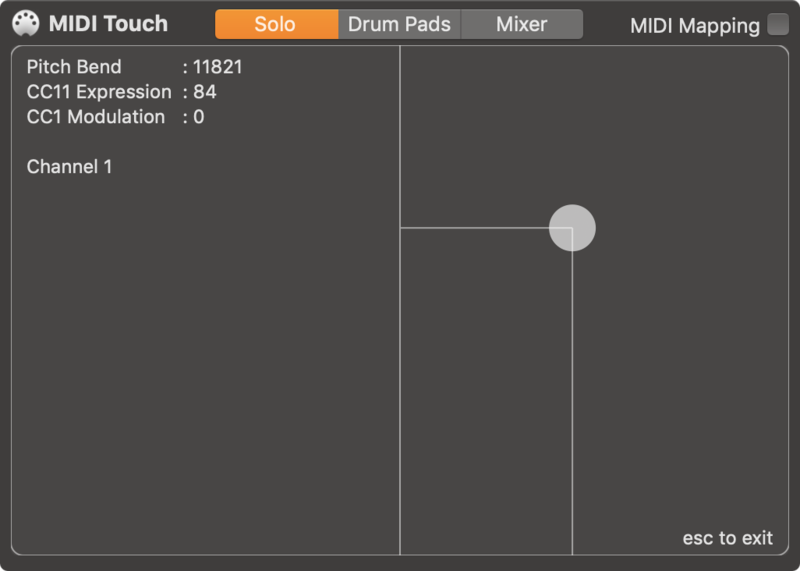 MIDI Room provides peer-to-peer connection between browsers and establishes RTC Data Channel for exchanging midi messages from and to any connected devices or virtual midi ports. Design sketch by XavorTM. 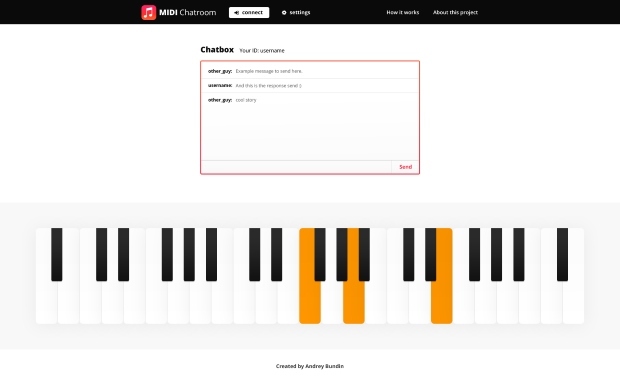 Lightweight open source virtual piano for web applications based on Web Audio API and Web MIDI API with realistic sound and correct full-length notes sustain.